I started a collecting hobby by gathering sea shells on seashores, but I refined it in the forests of northern Thailand. It was there I stumbled upon the ancient craft of lacquerware. 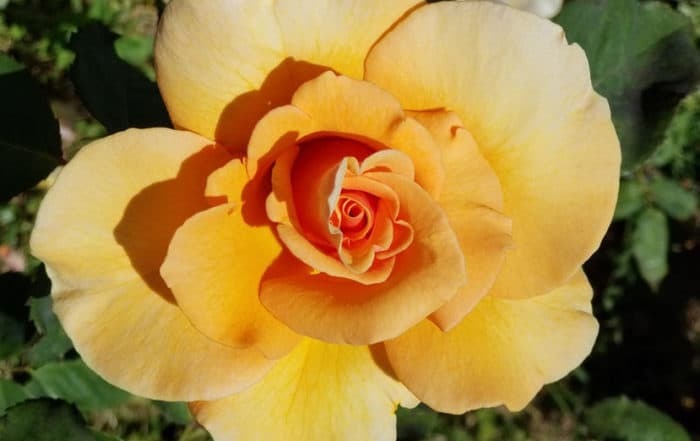 Considering that everything in northern Thailand is beautiful beyond measure, I’m still amazed that one particular handicraft stood out amidst that beauty, which lest we forget includes exquisite Thai silk. 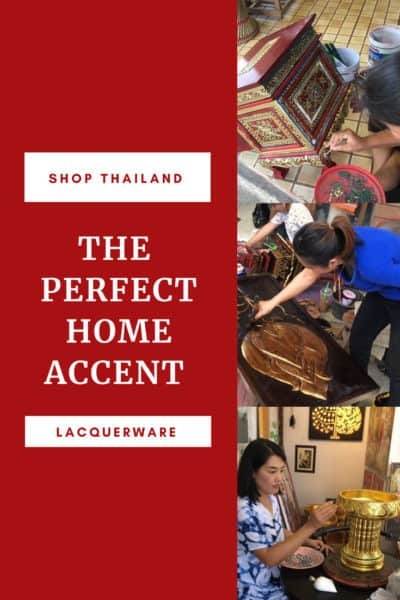 When it comes to collecting, Thai lacquerware is affordable art, ranging from under a $100 for contemporary pieces to several hundred dollars or even thousands for an antique. And, fortunately for me, it’s not easy to break, notwithstanding my earlier comment on stumbling. The art of lacquer dates back thousands of years in China, arguably standing as one of the most ancient handicrafts of Asian culture. 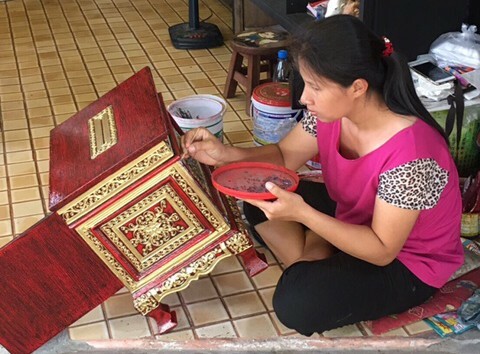 About 400 years ago, the Thais began advancing the art of lacquer, passing those techniques from generation to generation. 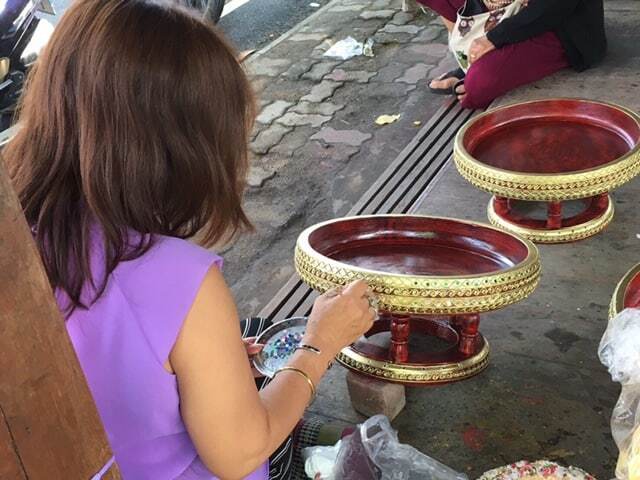 Nowadays, most all Thai lacquerware is produced in the northern regions. As a craft, lacquerware had humble yet practical beginnings. The purpose was to make utensils more durable by coating the surface with sap from the rak tree. 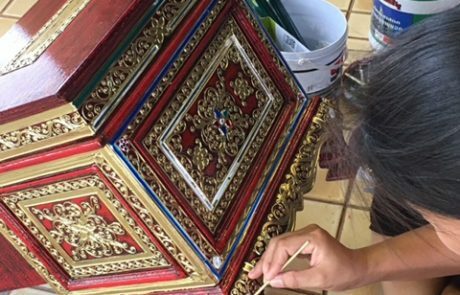 Today’s Thai lacquer art still involves processed sap slowly applied over bamboo or wood. In the past, teak was the wood of choice, but deforestation problems in Thailand halted the practice. In contemporary mass-produced lacquerware, the coating, which may even be synthetic, is often applied over clay, paper, or metal. Collector tip: Authentic lacquerware is not made outside of Asia. The lacquering process can take a few days to weeks depending on the quality desired. 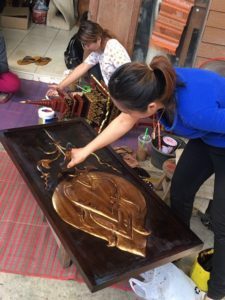 Higher quality lacquerware is created by applying the resin over bamboo or mango wood, waiting about a week — or weeks — for drying, and then repeating the process multiple times. 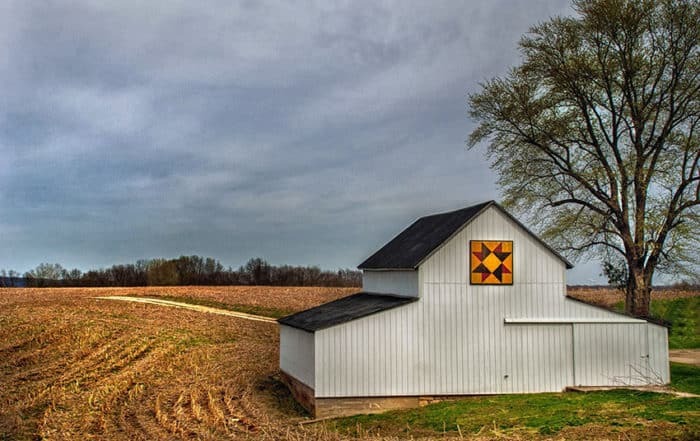 The result is a smooth, impermeable surface resistant to heat, water, bacteria, and insects. The typically glossy, black surface of lacquerware is beautiful in itself. But the long journey of lacquerware doesn’t end there. 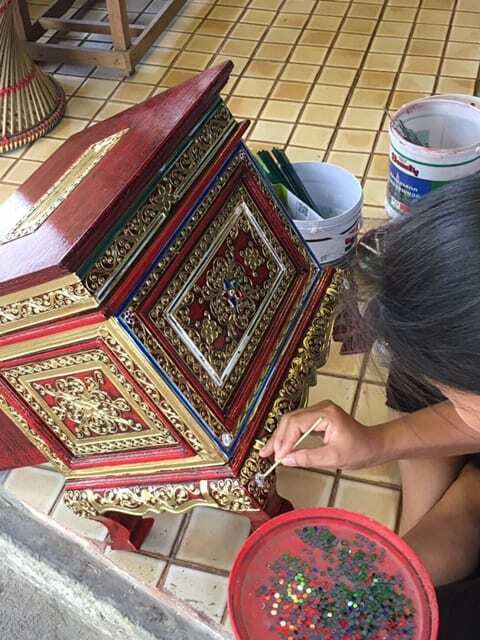 The northern artisans of the Chiang Mai region engrave intricate, color-filled designs. Traditionally, the artisans used a gold-on-black technique known as Gold Leaf. 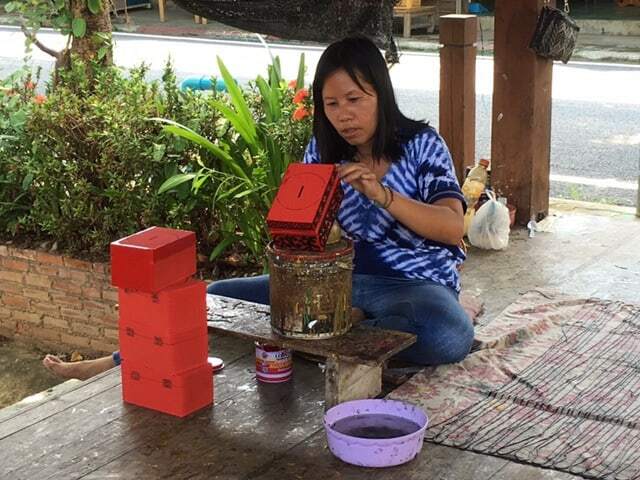 Lacquerware houses in northern Thailand still use a similar technique. Chatuchak Weekend Market — the bargain hunter’s paradise. With over 200,000 visitors in a weekend and 15,000 plus vendors, this is the world’s largest weekend market. There’s not a lacquerware section, per se, but the handicraft is so prolific you’ll no doubt run into dozens of vendors selling lacquerware at affordable prices. Don’t forget to bargain! 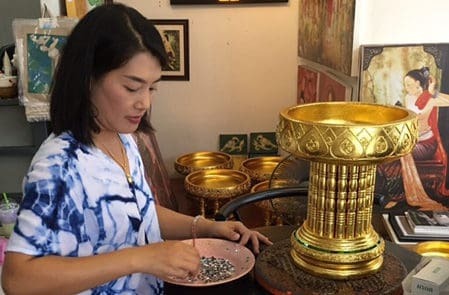 Narai Phand — Thailand’s largest handicraft center is a joint venture between the Thai government and the private sector. 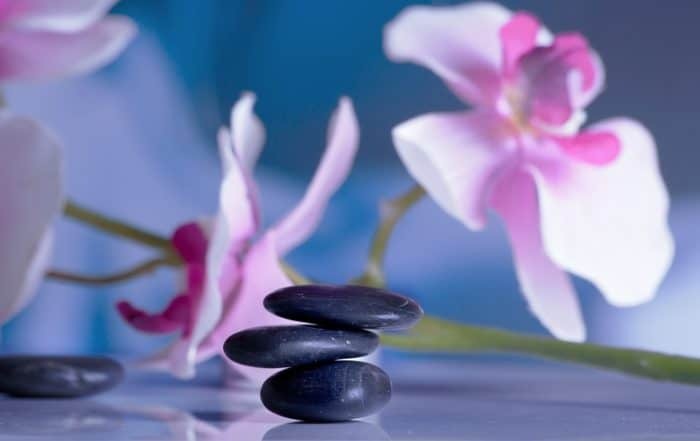 Don’t expect to find bargains, but the tradeoff is worth it. The lacquerware here is nothing less than exquisite. 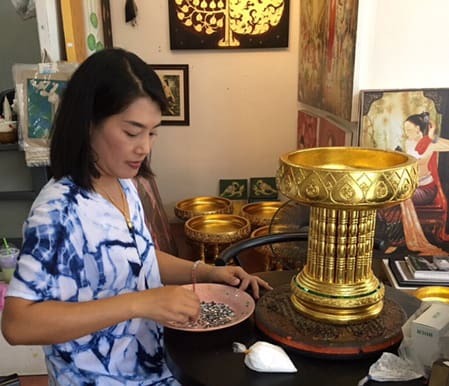 My advice is to buy the affordable gifts and souvenirs at the weekend market, and shop at Narai Phand for collectible pieces. 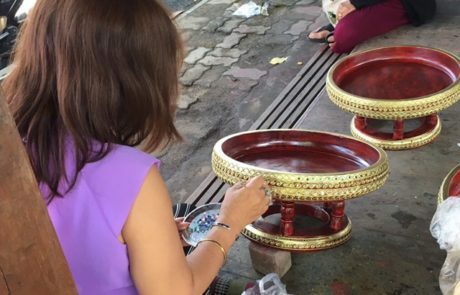 From street markets to upscale galleries to emporiums on the famous handicraft highway, lacquerware is everywhere in Chiang Mai. Ban-Khern Lacquerware, founded in 1972 by Mr. Vicha Sompamitr, who is known to personally train all the artisans in his lacquerware technique. Ban-Khern is an award winning company and a co-founder of theThai Association of Lacquerware Manufacturers. 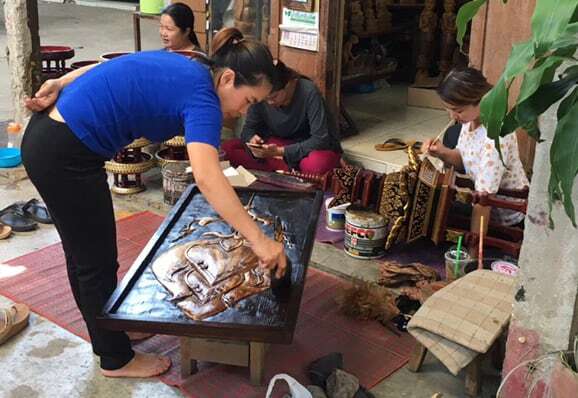 Lai Thong is another popular emporium for lacquerware on the handicraft highway for not only its large showroom but also for the free factory tour and the chance to see artisans at work. 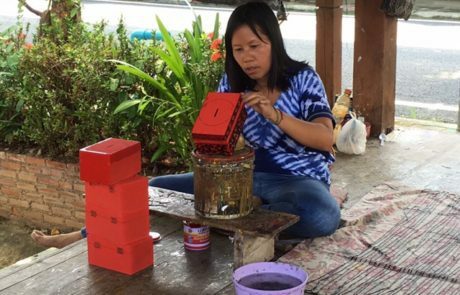 Avoid bargaining with tuk-tuk or taxi drivers for your tour of the cottage industry and villages along SanKampaeng Road. They get commissions and can drive up the price of goods you purchase. 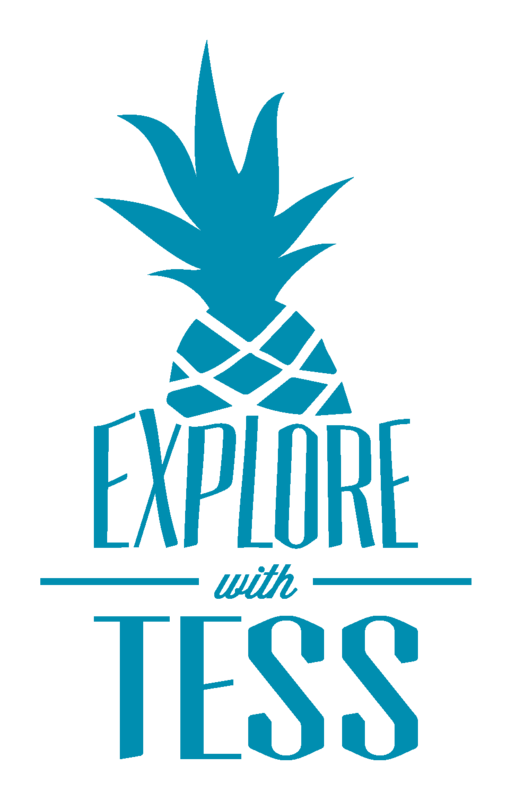 Instead, make arrangements with your concierge or travel agent for local tour operators. More adventurous travelers may decide to rent motor bikes. Save for later. PIN it. 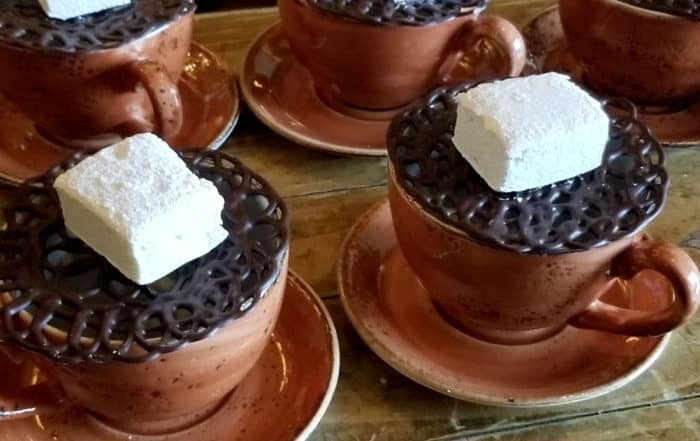 The hot chocolate never goes out of season at this luxury resort in the Rocky Mountains. The French-inspired creation uses premium chocolate made in a small village along the Rhône River. And you thought coffee was fashionable! 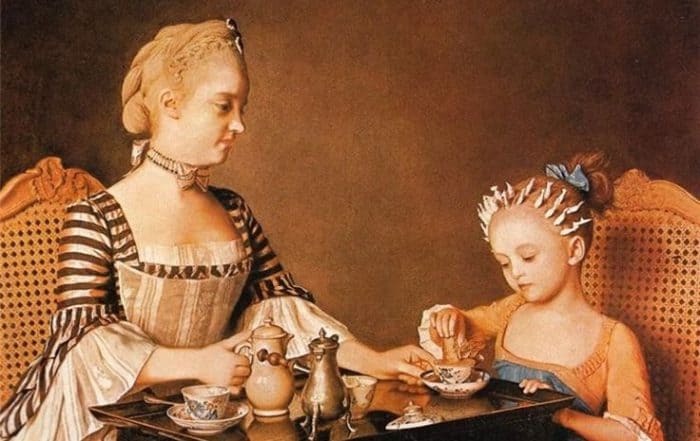 Here's the real story behind hot chocolate's far-from-humble status in 18th Century France, and how a refined vessel found its place in history and art. 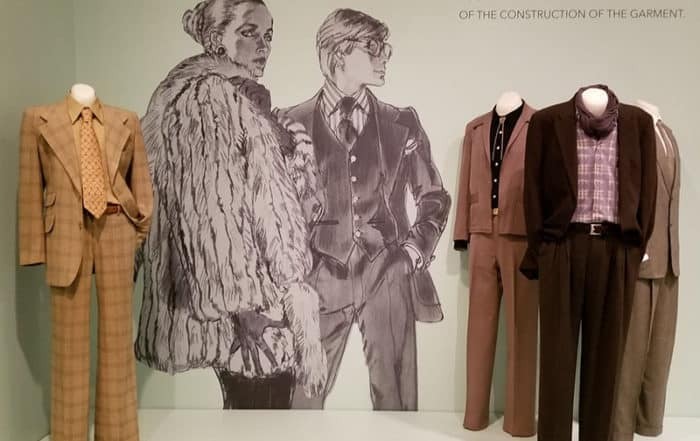 The Drawn to Glamour exhibit at the Denver Art Museum takes viewers on a sophisticated journey of fashion illustration, featuring styles of iconic fashion houses, such as Dior and Ives Saint Laurent.